Home » 5 Freshest » Old Fashioned Vanilla Creme Drops: Yes. They are That. “This is the real name of these things? 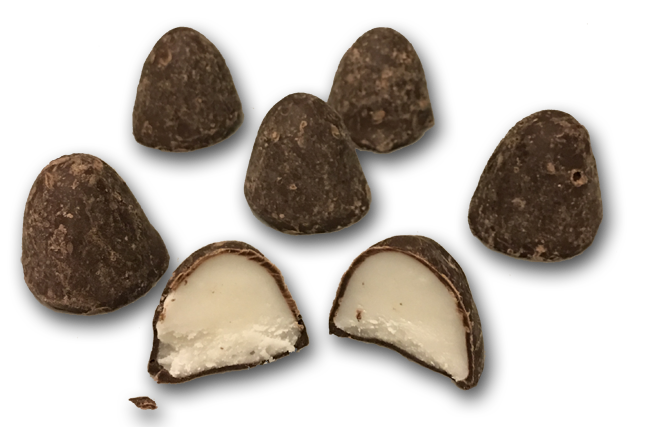 There must be a million things called Vanilla Creme Drops,” I said to myself as I started in on this review. 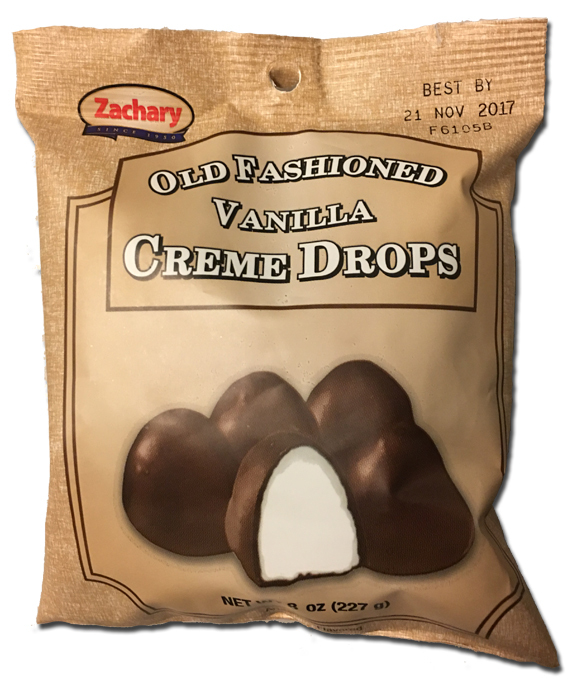 These vanilla creme drops may not come with a mountain of eggs, spuds, cheese, bacon and sour cream (that’s Mike’s Mess. Again, at Zachary‘S). But these are pretty good. Simple, def old fashioned, somewhat delightful. It starts with the chocolate outside, which isn’t run-of-the-mill milk chocolate coating. It’s almost dark in flavor. When I opened the bag, the aroma wafting out reminded me of a chocolate store, like See’s. The other thing that sucked me in is the vanilla. I won’t apologize for liking vanilla. I order vanilla ice cream over any other flavor, I like vanilla-filled cookies, I like vanilla creme… Wait. Now exactly how is ‘creme’ different than ‘cream’? A quick googles search says It isn’t. It’s French, and it’s the same thing. Anyhoo, the vanilla creme is pretty spot on. The size of these things is interesting. Kinda big. Too big, IMHO, to eat the whole thing at once. Best to take little bites. And when you do, these things start super rich and dense, but then slowly soften and get really creamy. Thus ITS NAME. YEAH BOYYYYEEEEE. So look – I like these. Sure, the package couldn’t be more plain, and yes the back of the package says the drops are made in a “state of the art” facility, which I think was important back in 1961… but still, I’m a sucker for nostalgia and I like things that taste good. So if you’re looking to make your girlfriend’s gramma proud, buy these. While these are intriguing, and sound delicious, your review of them makes me REALLY want to get a Mike’s Mess. I lived in Santa Cruz and Lompico back in the ’90s, but I was too broke to go out for breakfast; so I guess I missed out on this amazing Zachary’s experience. I used to eat that candy as a child in the 1960’s and 1970’s.Good, but really sweet.Usually back then,they were sold openly in boxes, in small town stores and you used a scooper and put how much you wanted in a sack, priced by the weight of it.As a child that candy reminded me of Chico Marx’s hat, only without a brim. Chico Marx. He was hilarious.